Contains Jerusalem Artichoke, Dandelion Leaves, and Yacon Root are Short-chain Fructooligosaccharides that make up the Prebiotic Blend, which helps to fuel the Probiotic so it can arrive safely (delivery system) in the large intestine for maximum benefit. 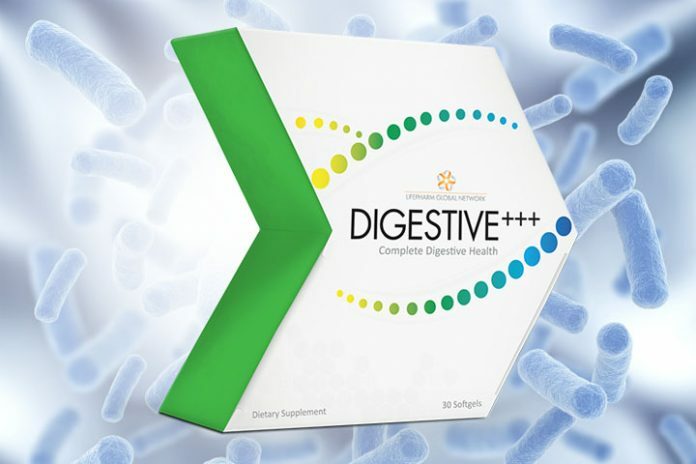 This comprehensive Enzyme Blend helps nutrient absorption (Protease, Peptidase, Carbohydrates, Sugars, Fats) and help digest sugars found in legumes and cruciferous vegetables. With Lactase to help digest sugars found in milk and dairy products. This blend of short-chain Fructooligosaccharides (FOS) fuels the probiotic in the body which encouraging neutralizing acid in the stomach. This improves bacterial balance that keeps the large intestine healthy and functioning well while encouraging neutralizing acid in the stomach. The Probiotic in DIGESTIVE+++ is spore-forming so it’s extra tough, shelf stable and heat-resistant which makes it better than other probiotic supplements. Rich in high in Omega-3 fatty acids, flaxseed has been known to help reduce cancer cell growth, skin health, inflammation, but more importantly diarrhea. This blend works on the small intestine to ensure the proper digestion of food and absorption of nutrients. These are proteins (protease & peptidase), carbohydrates (amylase, glucoamylase), sugars (invertase, acid maltase), fats (lipase), alpha-galactosidase (to help digest sugars found in pulses and cruciferous vegetables), and lactose (For proper digestion of sugars found in milk and dairy products). Gelatin, Glycerin, Beeswax, Purified Water, Sunflower Lecithin (non-GMO), Titanium Dioxide, Sodium Copper Chlorophyllin, Silicone Dioxide.